located off HWY 112, right across from Central Park Elementary (and zoned for it) - St. Valery is a gated community with large lots (most are right around an acre) with gorgeous homes in many different styles. To see homes currently for sale in St. Valery - click here. 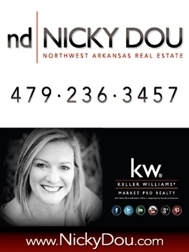 As the top selling Realtor in Northwest Arkansas (2014, 2015 & 2016) & #2 in 2017 - I looked long and hard to find "the perfect neighborhood for our family" and I am proud to say I call St. Valery HOME! We love it here. Moved in 2015 and it is such a great location and somewhat private with the larger lots/space between homes.